The early winter was relatively mild, but beware of sharp frosts in March and April that will spoil vulnerable plants – have fleece on hand and don’t be too hasty to put young plants outside. Even if we get a sunny day, temperatures can dip to freezing at night and strong winds can be destructive to new growth. If you haven’t already done so, weed and clean borders and top dress with a general purpose fertiliser such as Growmore, Fish Blood and Bone or 6X. Lime-hating plants such as camellias, rhododendrons and azaleas need an ericaceous fertiliser for the extra trace elements. Dead head bulbs, particularly daffodils, leaving the green foliage on, and top dress with fertiliser – they’ll send the food back to the bulb and you’ll get a better display next year. Dead heading spring bedding will also encourage more flowers. Remove old growth from perennials and divide if required. Put in stakes and supports before plants get too tall. Slugs and snails love young herbaceous shoots, especially in damp conditions – use a liquid slug killer or pellets. There are plenty of young plants available now, so fill in the gaps in borders with lupins, campanulas and hollyhocks – plant in groups of three or five for instant effect. Plug geraniums, fuchsia and hanging basket plants are all available too. Remember they need some heat especially at night, so either keep them in the house or make sure your greenhouse has some night heat. Many summer flowering bulbs and tubers such as lilies and gladioli can be planted outside as the weather warms up. Always plant lily bulbs on their side so water doesn’t lie in the scales and cause them to rot. 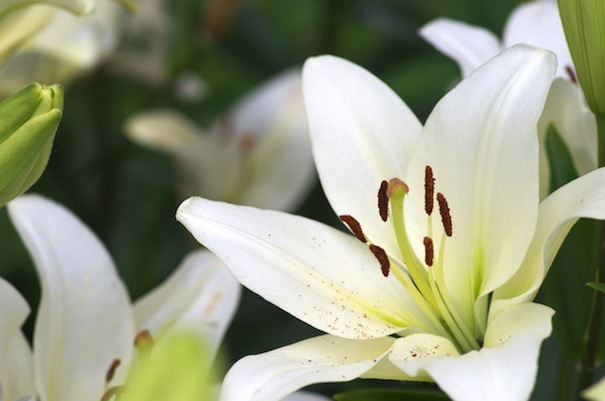 Lilies, especially the newer tree lilies, can be started in pots and planted outside once they’re stronger. Why not try the new ‘Carpet Lilies’ which – as the name suggests – are dwarf growing plants with a spreading habit. Dahlias and begonias can also be started off in pots inside then planted out once the danger of frosts has receded. Pruning of roses should be finished by now. Once several sets of complete leaves are open, spray them fortnightly with a combined fungicide and insecticide to prevent black spot, mildew and aphids. When the lawn starts growing in March, cutting can begin; a light cut first and gradually drop the mower height. Lightly fork over any bare patches and reseed or use Scotts Patch Magic, which contains everything you need. Moss and weed killer can be also applied. If your lawn has a lot of moss, try MO Bacter, a new slow-release organic fertiliser. This feeds the lawn over a 12-week period, contains bacteria naturally found in the soil and when added to fertiliser will consume thatch and moss, making it unnecessary to rake or scarify. Complete digging over the vegetable patch, adding well-rotted manure or compost and a general purpose fertiliser such as Growmore or 6X. Carrots, celery, beetroot, leeks, onions, broad beans, lettuce, early peas, shallots and hardy herbs – mint, rosemary, lavender – can all be sown or planted outside during April if it’s mild. Annual herbs also need to be sown – fennel, parsley, savoury and dill need replenishing every year. Potatoes can be started off, but protect against late frosts. Sow a few seeds at regular intervals so you get a succession of crops rather than a glut. Start off tender vegetables under protection: tomatoes, peppers, courgettes and cucumbers all need to be kept warm, especially at night. If you’re not comfortable with your greenhouse temperature, your tomatoes and cucumbers won’t be either – it’s best to be cautious and sow later rather than earlier. As apples, pears and plums come into leaf, watch for the first signs of insect damage and spray as soon as pests appear. Do not spray when the trees are full of open flowers – wait until flowering has finished.